Preheat oven to 350°F. Spray a 15x10x1-inch jelly roll pan with cooking or baking spray. Line with parchment paper and spray paper with cooking or baking spray. Place paper baking cup in each of 8 regular-size muffin cups (to use with the excess cake mix). 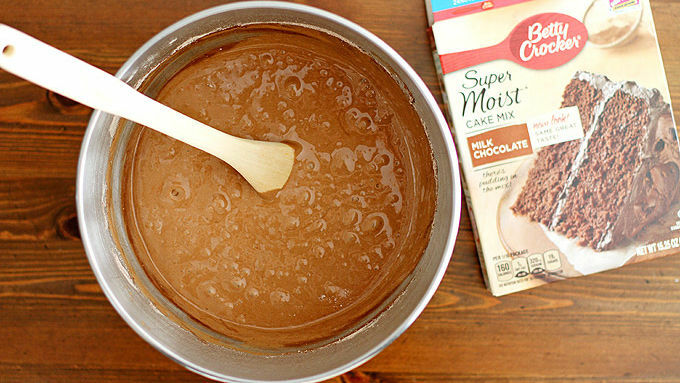 In a large bowl, beat cake mix, water, oil and eggs on medium speed until well combined. Pour 2 1/2 cups of batter into prepared baking pan; divide remaining batter evenly into muffin cups. Bake cake 12 to 15 minutes (cupcakes 14 to 16 minutes) until firm when lightly touched in center. Cool cupcakes completely; freeze for a future use. 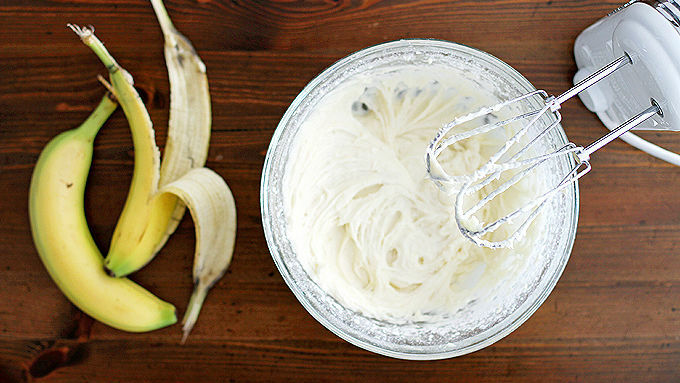 While the cake is baking, make the banana filling: In a large bowl using an electric hand mixer, beat banana, butter, lemon juice, vanilla and salt until smooth. Add powdered sugar; mix well. Unroll a clean kitchen towel on a large surface; sprinkle with 2 tablespoons powdered sugar. 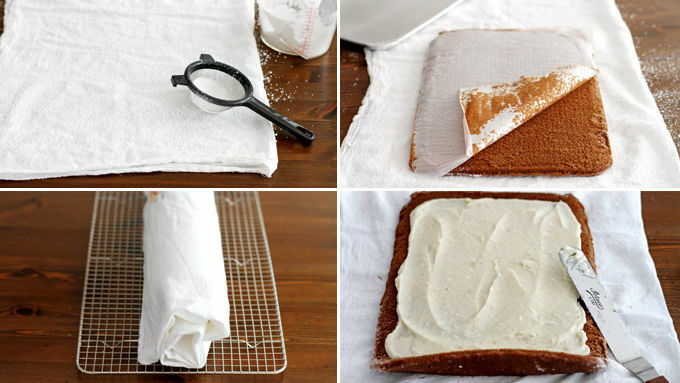 Carefully invert warm cake onto towel; remove parchment paper. Roll up cake in towel like a log. Place on a cooling rack; cool 30 minutes. Carefully unroll cooled cake. Spread banana filling over cake to within 1/2-inch of edges. 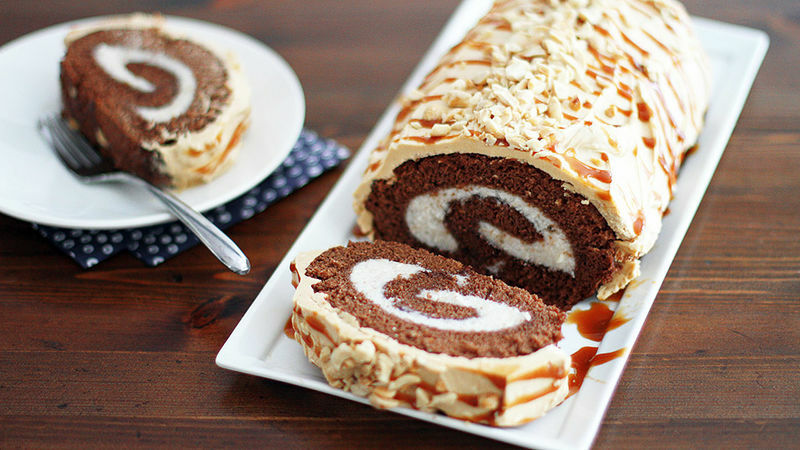 Carefully reroll cake and place on a serving plate. Chill cake at least 2 hours before frosting. To make the peanut butter buttercream: In a large bowl using an electric hand mixer, beat peanut butter, butter and vanilla until smooth. Add powdered sugar; mix well. Frost top and sides of chilled cake with buttercream. Drizzle with caramel sauce and top with chopped dry-roasted peanuts just before serving. Serve cake chilled or at room temperature; it’s delicious either way! Use an extra-sharp, clean knife for clean, pretty, swirled slices. Looks hard, but wait! Our step-by-step shows you how easy this treat is to make. When it comes to cake, there’s never too much of a good thing, amiright? That’s the thought process I went with into baking this amazing roll cake. A swirl of sweet banana filling in a moist milk chocolate cake, topped with a creamy peanut butter frosting, caramel drizzle and dry-roasted peanuts = UH YAASSSS. There’s a droolfest going on over here, that's for sure. Roll cakes used to intimidate me, but the truth is they are actually simple, and the results are so pretty! So that’s rad. But more importantly, this cake is so tasty, you just don’t want to miss out on it. So follow the steps here, and you’ll be on your way to caramel-chocolate-banana-peanut butter bliss. Slice using a very sharp, clean knife for the prettiest, swirliest, bestest slices. Serve cake chilled or at room temperature; it’s delicious either way! 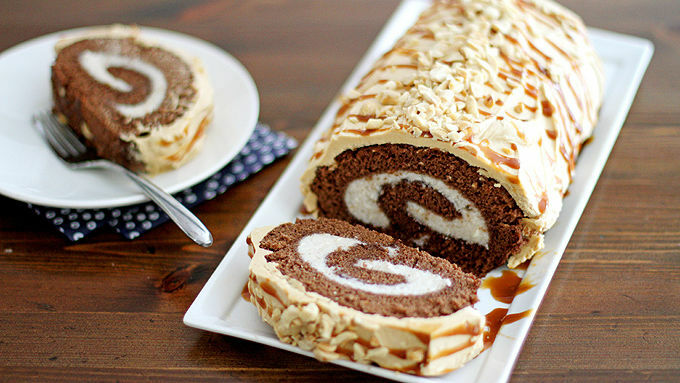 It’s that easy to get a roll cake in your life! And caramel, chocolate, banana and peanut butter in your belly all at the same time.